Alive and swimming, the Orange Roughy’s appearance might easily alarm a baby. (Here are some wikipedia photos.) So might its name, had not the US National Marine Fisheries rechristened it in 1976…transforming the ‘Slimehead’ into the ‘Orange Roughy’ to enhance the fish’s appeal in the marketplace. 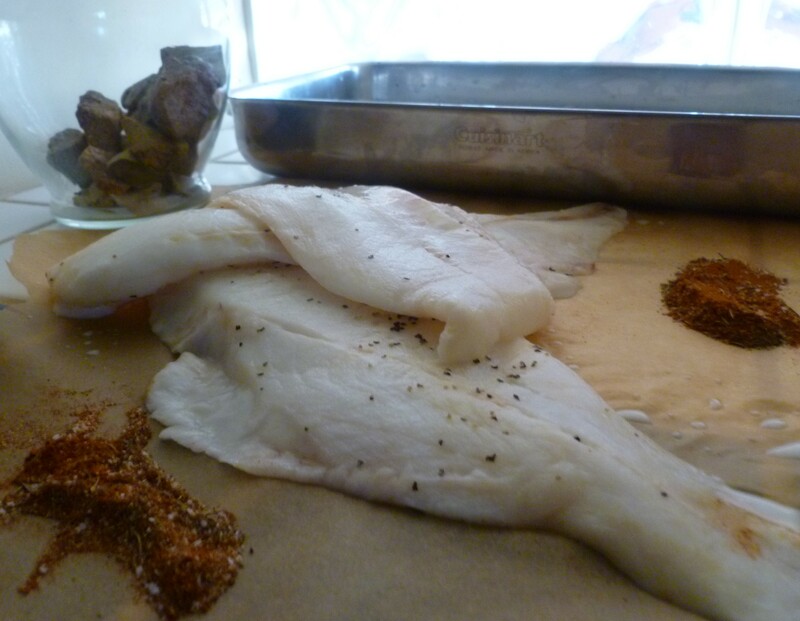 Skinned and filleted, it is indeed a fine ‘fishy’ for anyone’s ‘dishy’…babe or adult. A single fillet is of the right size to serve a single person. The flesh is firm and therefore holds together well when sautéed. And its mild flavour is an obliging foundation for a variety of herbs and spices. In the diplomatickitchen menu A Lunch with Spice and Many Things Nice, Orange Roughy is served with Potato Croquettes and Orange Remoulade Sauce. The remoulade will suit the fish as well as it does the croquettes. 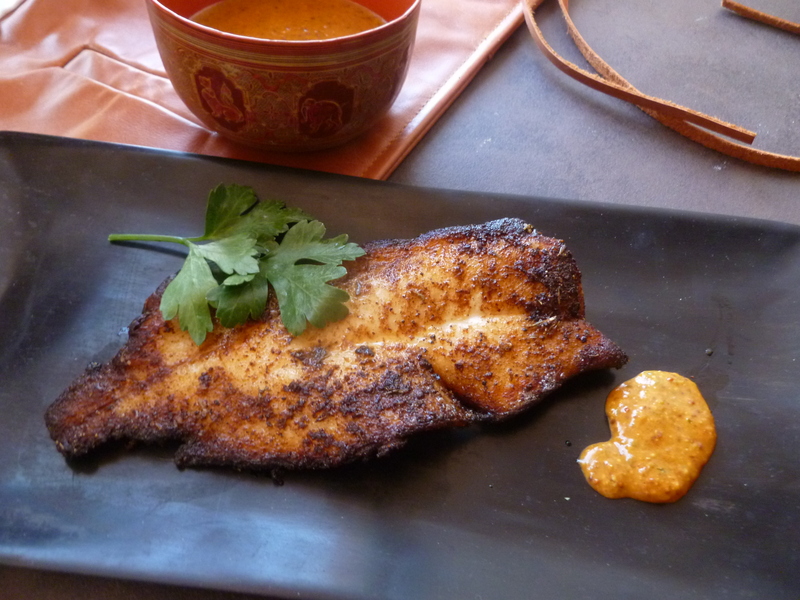 The fish is highly spiced and blackens as it sears. This is how it should look and does not at all indicate a burnt quality or taste. Timing Note: The fillets will profit by a milk bath of up to 6 hours. (See the description below for how to do this.) The fillets may be buttered and spiced in advance and refrigerated until just before they are cooked. Sauté them just before serving….they will be done in about 6 minutes. 1/2 cup of softened Butter plus 3/4 cup of Butter, melted and clarified: To clarify the butter, melt it slowly in a small pot. Tip the pot and skim the foam and white solids off, leaving the clear yellow (clarified) part of the butter in the pot. The clarified butter burns at a higher temperature than whole butter and is very good for sautéing something without burning it. 1. Even if the fish fillets are fresh, and certainly if they are frozen, a milk bath is recommended for removing any ‘fishy’ smell. Place the fish in a shallow pan or casserole, pour in milk to cover them, adding a teaspoon each of coarse ground salt and pepper and allow the fish to soak, refrigerated for up to 6 hours. 2. Mix together in a small bowl the thyme, cayenne, paprika, salt, garlic powder, and pepper. 4. Pour half of the clarified butter into the pan and heat it over a medium flame until it is hot. Add half of the fillets and cook them for about 3 minutes on one side. (The first side of the fillets, when done, will be golden with blackened edgings.) Turn them and cook them for about 3 minutes on the second side. Wipe out the pan, add the remaining clarified butter and sauté the remaining fillets in the same way. 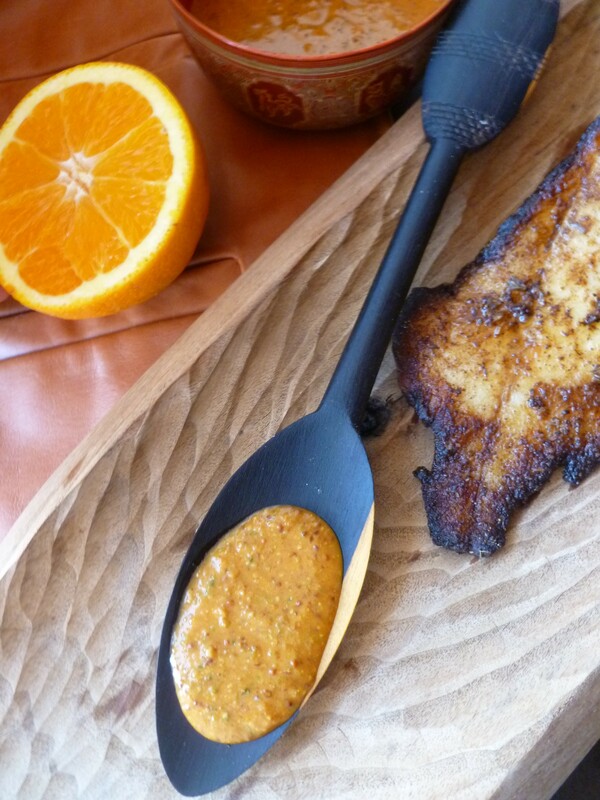 Serve at once and with the Orange Remoulade Sauce if you like. 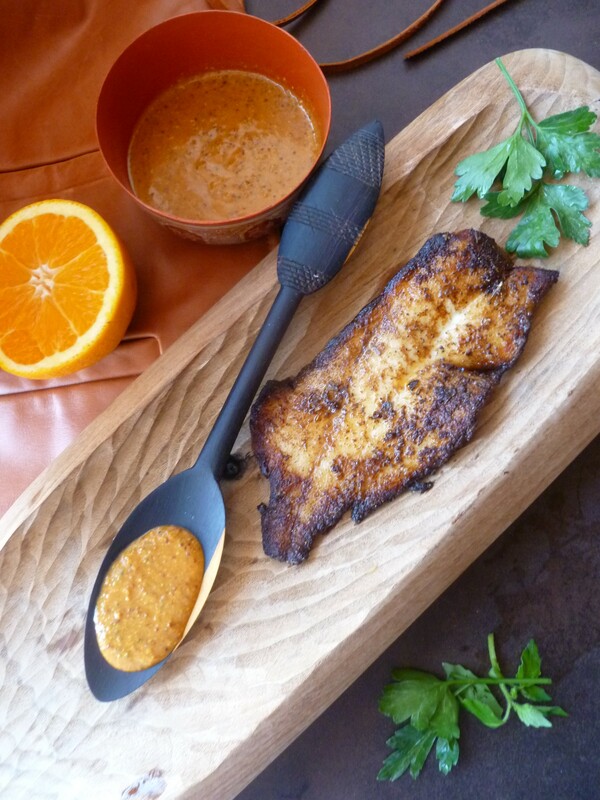 Orange Remoulade Redux: for about 1 cup (The recipe is repeated below for convenience. The sauce is suggested as an accompaniment to the Potato Croquettes that are served with the fish in the lunch menu: A Lunch with Spice and Many Things Nice. But, it is good with the fish as well. 1. Place all the ingredients in the processor or blender and mix until the ingredients form a smooth sauce. 2. Transfer the sauce to a bowl and refrigerate it, covered, for at least 30 minutes before serving. Any leftover sauce will keep well for many days refrigerated. 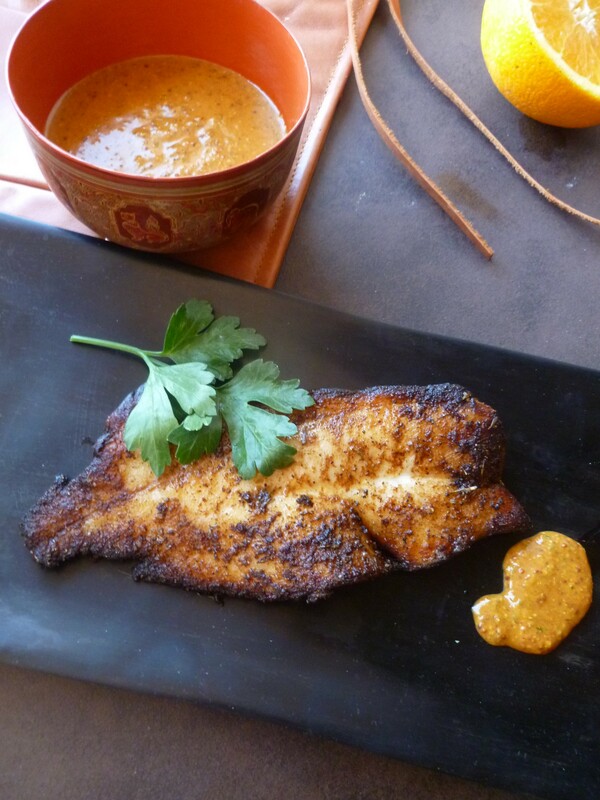 A Note: Spice-seared Orange Roughy is the Main Course of the Lunch Menu: A Lunch with Spice and Many Things Nice. 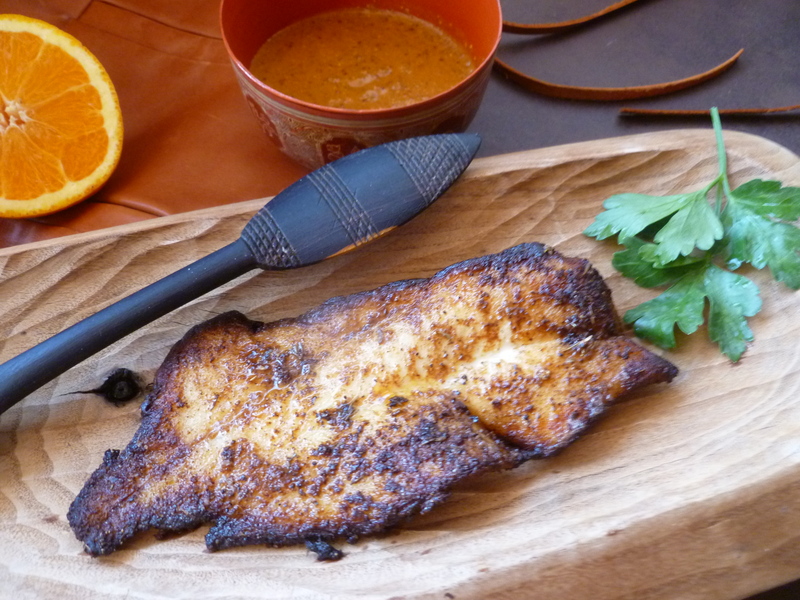 Both the fish and the sauce recipes are adapted from ones in an excellent cookbook about ‘Cowboy’ Cooking: Cooking the Cowboy Way by Grady Spears and June Naylor (2009).